Have you ever wanted to take a campervan road trip in a beautiful destination? Mark Gales shares his story about an epic road trip through New Zealand in, you guessed it, a campervan. Our campervan road trip started in Nelson, on the South Island of New Zealand. It’s a small town with a population of only 50,000, but it’s still the 12th most popular city in all of New Zealand. We picked up a campervan from the rental agency Campervan Finder and stayed the night at the beautiful Abel Tasman National Park. 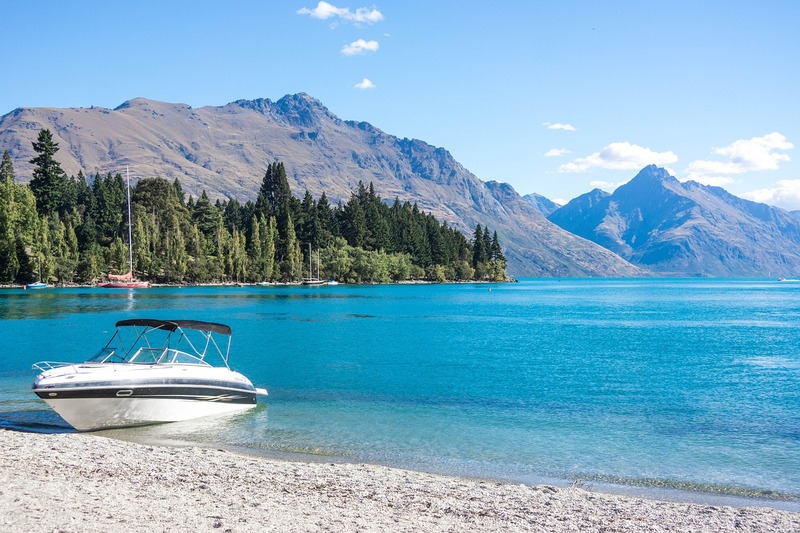 It’s the smallest national park in New Zealand but is surrounded by inviting sandy beaches and forest, with native wildlife joining the scenery. After leaving Abel Tasman National Park we set off down the west coast for a drive that defines ‘road-trip’. Hugging the rocky coast, the road took us past ‘the pancake rocks’ which supposedly look like pancakes stacked on top of one another. If like me, the phrase ‘pancake rocks’ makes you think of a flat rock somehow suspended in mid-air above a rock resembling a frying pan, then you too would have been disappointed with the actual pancake rocks! But in the end, they provided a pleasant and picturesque break from driving. As we headed up and over the cliffs in our little camper, we eventually reached our target of Franz Josef town where we had a glacier to climb. The Franz Josef Glacier is the lowest glacier in the world, and in the summer heat, as we ascended it, it was difficult to imagine how it didn’t just melt in a day. But at the top, we soon needed to don the gore-tex jackets as we crawled through chilly ice caves and up and over the ice ridges half way up. It was a fantastic experience and being on a ‘living’ glacier is not something you get to do every day! Our next stop with the campervan was the lakeside town of Wanaka. We spent the day wandering around the lake and admiring the views, as well as the lovely lakeside houses. Much to our surprise, we also managed to squeeze in a bit more wine tasting at Rippon winery – it seems as though the whole of New Zealand is capable of cultivating vineyards! We finished our visit to Wanaka with a strenuous walk up ‘Mount Iron’ which rewarded us with spectacular views of both Lake Wanaka and Lake Hawea (which we had camped alongside the night before). The following day we arrived in Queenstown, which is definitely one of the highlights of the south island. The town is famous for extreme sports, but after traveling for almost four months, we couldn’t afford to do any bungy jumping, rafting, jet-boating, paragliding, or any other of the crazy activities on offer. Instead, we parked our campervan and opted to enjoy the more affordable things, such as a cold beer on the waterfront, a walk along the ‘beach’ and a trip up the gondola combined with a ride on the luge. In the evening we headed for the recommended World Bar where we enjoyed some of the famous cocktail ‘teapots’! The drive from Queenstown to Glenorchy the following day was every bit as good as the drive down the west coast to Franz Josef glacier. The views were incredible, and blue skies replaced the rain we had in Queenstown that morning. That afternoon we went to the cinema to see the documentary ‘When a City Falls,’ which gave a fascinating account of the Christchurch earthquakes and prepared us for our visit to what is left of the city. Apart from the odd hello, it’s been just the two of us, which is in stark contrast to the hoards of travelers that you meet (and often have to share dorms with!) when staying in hostels Lake Pukaki (Mount Cook). While some of the credit for this can be attributed to enjoying each other’s company, I feel New Zealand’s plentiful supply of wine must also take some of the credit! Anyway, it was Emily and Rodger’s fantastic hospitality that meant our final few days in New Zealand were so memorable. After taking the dogs (Wills and the much less docile new arrival Benjy) for a walk to one of the deserted bays, we went for a nice meal at the local restaurant with their children Grace and Hugh. In the morning, I was treated to a second round of golf in as many weeks with Rodger, who I’m sure will expect me to mention that I beat him on his home course with half a set of ladies clubs! Liz was taken around more of the town with Emily, and then by lunchtime, it was time to become campers again, albeit only for a couple of hours as it was time to return the campervan and prepare for the next leg of the trip… Sydney! But that wasn’t before we had time to see what remains of Christchurch following the earthquakes. Although we’d seen the documentary which showed the damage in Christchurch, it didn’t quite prepare us for how inaccessible the city center now is, with most buildings either awaiting demolition or repair. Although they appear intact from the outside, after visiting Emily and Rodger’s old house, it is incredible to see the extent to which the interiors of the buildings are beyond repair. In a few hours, we had exhausted what was left to see in Christchurch so we packed up ready for our flight the next day and caught a film before having a final glass of Pinot Noir to toast a very successful time in New Zealand. We had amazing weather and the campervan hire meant that we saw this fantastic country in by far the best way possible. This post was written by Mark Gales and is a telling of his campervan road trip adventure in New Zealand. For more travel stories, be sure to subscribe so you never miss a post!